The Center for Drug Use and HIV Research (CDUHR) is a leading center for HIV, Hepatitis C and drug use research. 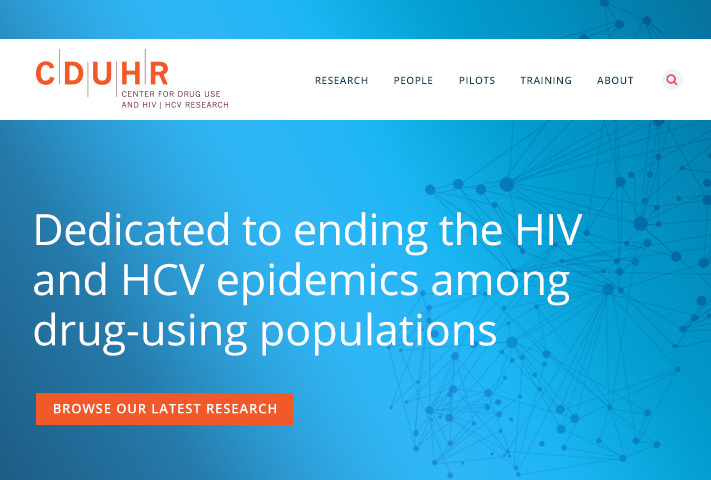 CDUHR partnered with Cabengo to re-envision its graphic identity and redesign its website, a core platform for the dissemination of its research. 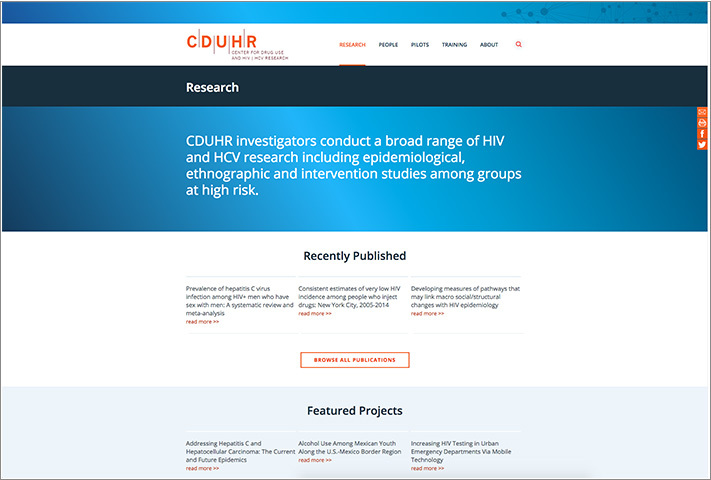 The new site needed to better reflect CDUHR’s public profile, distinctive focus, work and standards. We worked together to develop a digital strategy that defined objectives, priority audiences, and positioning, and then shaped the scope of content and defined the feature set. 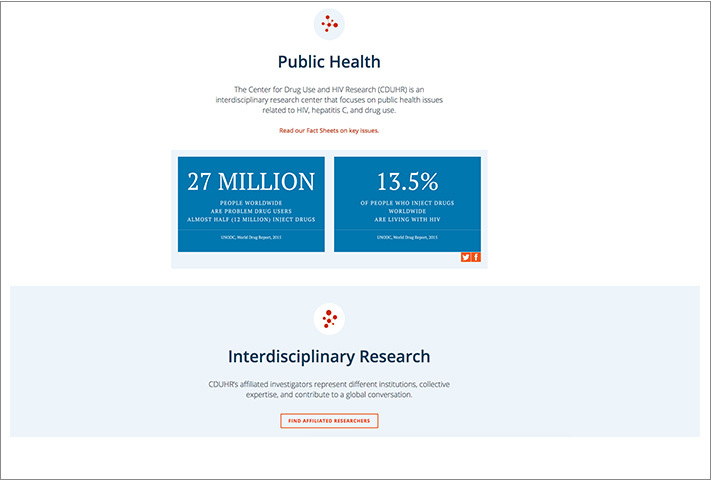 We created an intuitive, user-centered site architecture designed to surface and circulate CDUHR’s extensive trove of research. Well-conceived navigation encourages users to discover the connections between and among people, topics, projects and publications. Cabengo designed a new graphic identity for CDUHR, with a bold palette and clean, contemporary font. For the site, we created a sleek, minimalistic look and feel that positions CDUHR as straightforward, credible, and sophisticated. 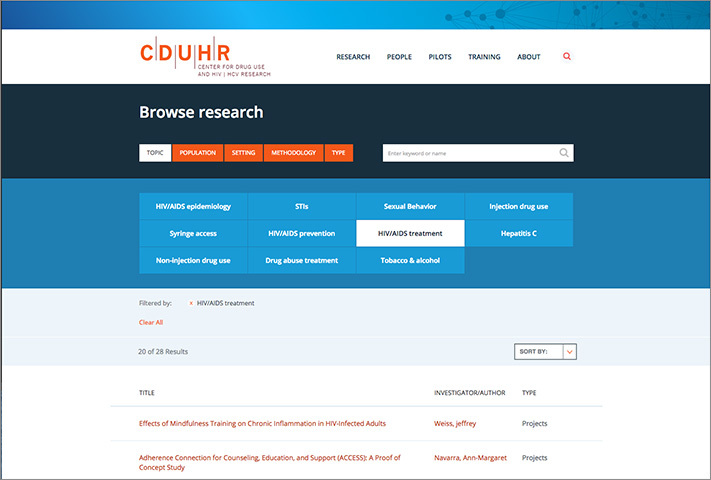 For the core “browse research” feature, we designed a lively interface that invites researchers and policy-audiences to explore CDUHR’s research by topic, population, setting, methodology or type. We built the site using WordPress as the underlying CMS.